Fire Lizard is an Enemy in Demon's Souls. They are found primarily in the first section of Stonefang Tunnel. Their only direct attack is a medium-range lunge that deals fire damage and staggers the player if not blocked. However, touching them except with a weapon will also deal minor fire damage. 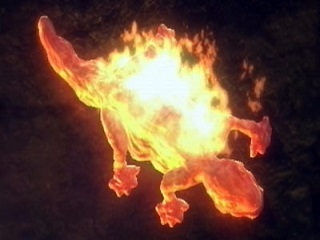 Notably, due to their short stature, it is relatively difficult to hit a Fire Lizard with diagonal or horizontal attacks; if this sort of attack is the only option, it is best not to lock on to the Fire Lizard. They are virtually immune to fire, but have low defense and HP otherwise. They rarely drop Meltstone upon death. Lunging attack. Stretch themselves like a sling and fly forward a bit. Usually they are sticking on walls and not moving. But if you have a wide area, you can easily sidestep their lunging attack. Sometimes they'll end up on their back after a lunge, completely helpless. Just smack them with melee attacks when this happens until they die. Soul Arrow and Soul Ray are particularily effective against this enemy.